With all of the blogging about touring and camping, I really haven’t broken down in much detail how everything gets loaded up in the bags. Believe it or not, there actually is a logic to how all of this fits together. Keep in mind at this point that this is my camping configuration, intended for wilderness camping trips of a few days at most. I’ve yet to go on any extended tour, and while quite similar, I would expect some changes/additions. My approach to gear is that bike camping doesn’t require the lightest weight kit that is made, so you can both save a little money and put a bit more focus on comfort. I’m not an experienced outdoorsman and I wouldn’t last too long on one of those survivalist shows, so my choice in gear reflects a balance between comfort, cost, weight, and size. I am starting to acquire some lighter gear, but that is more related to planning some backpacking hikes. As best as I could, I’ve tried to compartmentalize things. Behind the saddle is a Carradice Pendle bag. This bag stays on the bike most of the time, and is just perfect for day trips, or as my “go to” bag. I typically end up stuffing any extra clothes, gloves, snacks, a rain poncho, an LED headlamp, snacks or whatever into the main pocket. On longer rides, a dry pair of shorts really come in handy. Depending on the weather, I might also carry/wear tights, wind pants, a wool sweater, a windbreaker, balaclava, wool knit cap, and wool gloves. There is one of those thin plastic ponchos folded in the bottom. The bag has also been reinforced with a plastic sheet cut from a cat litter tub so it holds its shape; and I have it secured so that it rides upright. I can’t understand why so many riders have them hanging almost sideways with the strap around the seatpost. The right pocket is my toolbox with a spare tube, a bike tool, a Leatherman, and some zip ties. The left pocket is for a patch kit, spare batteries, a length of clothes line and a box with some band-aids and loose change. You also might find some sun screen and a tube of vaseline. The tent gets strapped to the front rack/basket. I’ve got a choice between a Kelty Gunnison 2 person and a Big Agnes Seedhouse SL1. 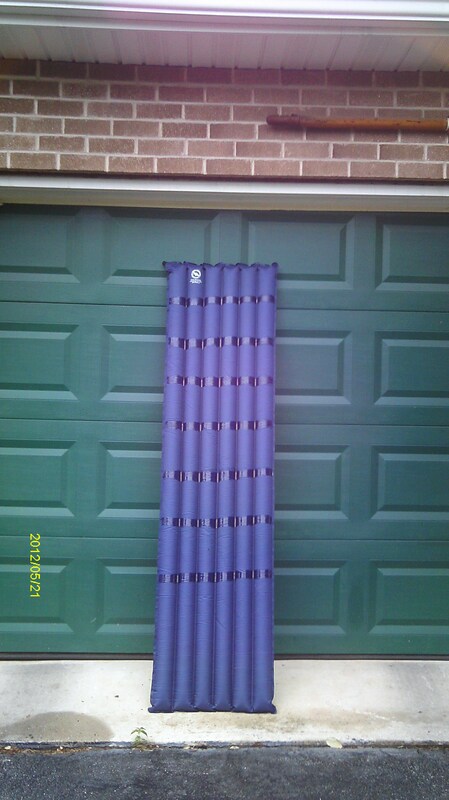 Both tents have rainflies and groundcloths, and I purchased them used. The Kelty weighs about twice as much as the Seedhouse, but going with a two person tent can be a good move, because that extra space comes in handy and it’s a lot easier to move around inside for setting up and changing clothes. It’s made for two people, but I think two people might find it a little tight. The rainfly also creates two vestibules, which are handy for getting the panniers and other gear out of the weather overnight. The whole works sets up really fast and only requires four small stakes. 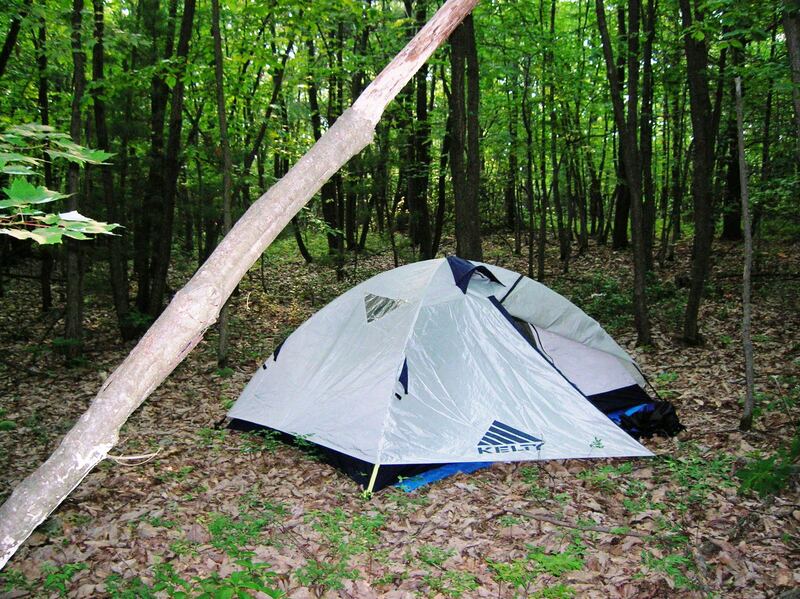 When using this tent, it all packs up along with groundcloth in a compression sack that cinches down pretty small. For any trip over three days, or if rain is in the forecast, this tent gets pressed into use. 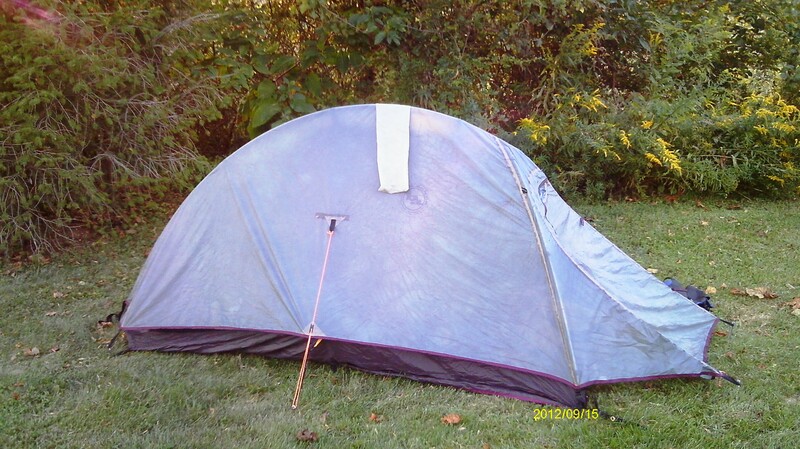 The Big Agnes is one of the pieces of “ultralight gear” that I have. I had been lusting over an Integral Designs Unishelter bivy, and even had one picked out, when the Seedhouse popped up on Ebay with a BIN price roughly one third of the cost new, and way below the Unishelter. It’s actually lighter than the bivy and packs down just a little smaller, even though it has enough room to sit upright and change clothes. The only downside is that it is not completely free standing, and you need to plant several stakes to set it up. That can be a problem on rocky ground. It also takes a little bit of practice to assemble the pole mechanism and stake things out. BTW: I really like the ALPS lateral compression sacks, that end up creating a tube rather than a ball. They’re easier to lash down, stuff in a pannier or backpack, and I think they end up smaller. Plus, you can find them dirt cheap. 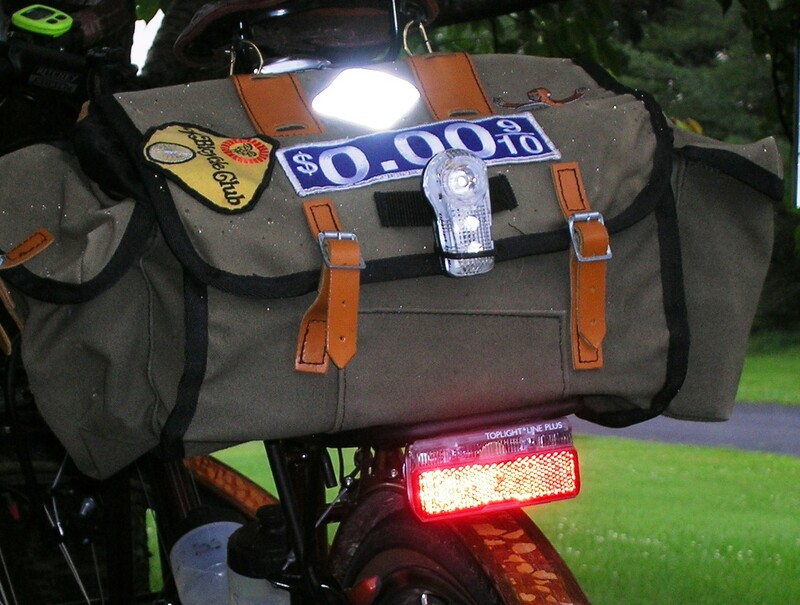 The panniers are “semi-custom” made by Swift Industries in Seattle. All that semi-custom means is that you get to pick the fabric, colors, and a few options. I like the oiled canvas both for the weather protection and the classic look similar to the Carradice bag. I was looking at several options for panniers as well as size, and these pretty much fit the bill for everything I wanted; but I paid way more than what I was originally planning. Now granted, they are extremely well made and worth every penny, but I found that good panniers with multi-pockets are expensive. The right pannier is the bedroom. The main pocket holds the sleeping bag, pad, and usually some extra clothes. I got turned on to Montbell after reading Kent Peterson’s blog and his minimalist camping techniques, and then started doing some research of my own. The bags are very well made, incredibly light weight, and pack down small. In a nut shell, these bags have 800 power down in elastic baffles – so while they loft up really well, the elastic also keeps the bags close to the body. This allows for plenty of room, yet it eliminates the need to warm dead air space. There are a few downsides. Montbells are pricey. Fortunately I was able to get one at a discontinued discount and the other I purchased used off of Craigslist. The other thing I’ve found, and this seems to be a common issue, is that the down is placed in baffles so the user can distribute it to areas of the bag that they want extra warmth. This invariably leads to some cold spots if you’re not careful. I think the secret is to distribute the down as best you can, and leave time for the bag to loft up before crawling in for the night. Since I haven’t planned any longer trips, I think using a down bag, and not worrying about excessive moisture, is prudent. I’ve also used a Big Agnes Lost Ranger, a down bag rated for 15F, and a BA Skinny Fish, which is the synthetic equivalent. Both are great bags for bike camping, and quite affordable. Top Row: BA Seedhouse SL1 tent, Montbell UL SuperSpiral bag, BA insulated pad, REI Polartech bag liner. 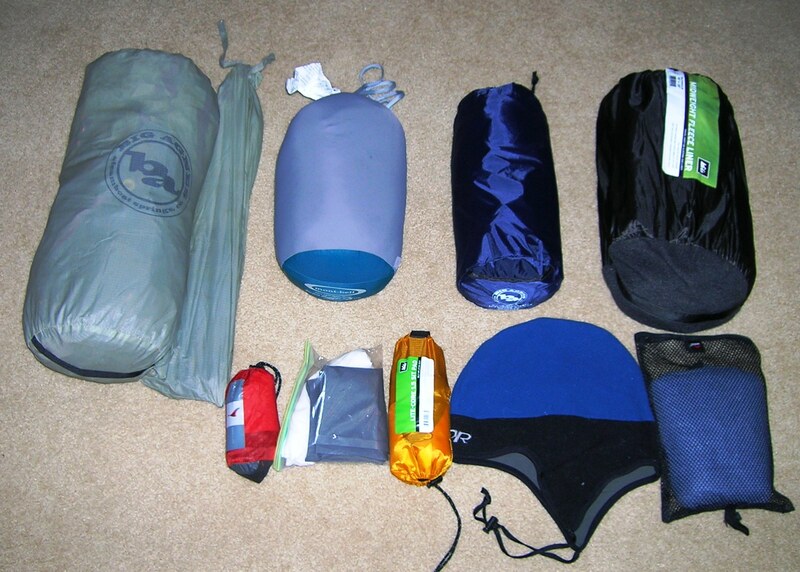 Bottom row: Exped pillow, second pillow and case, REI seat pad, Outdoor Research Peru cap, MSR pack towel. 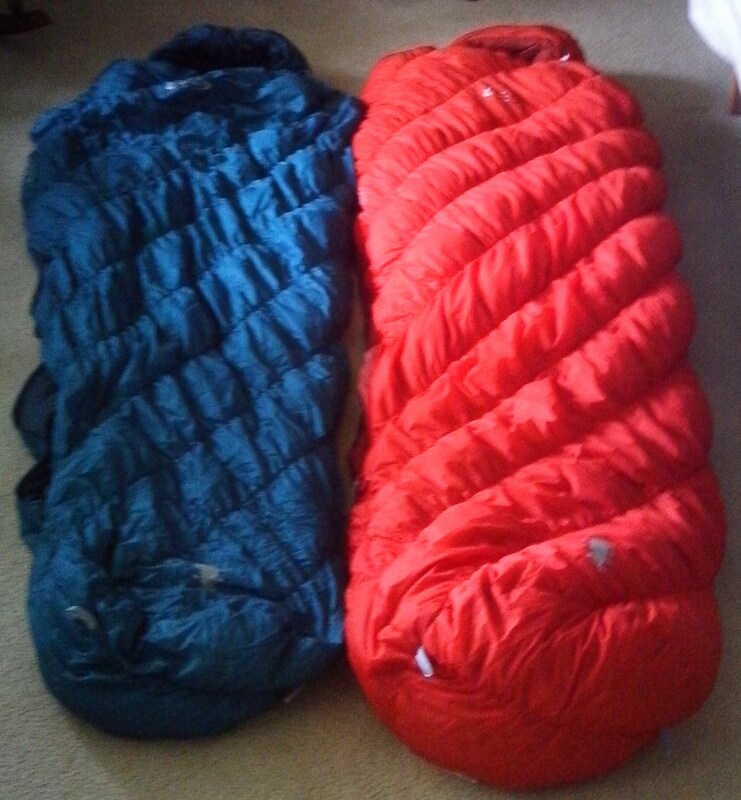 For a pad, I have two options, both from Big Agnes. If it looks like the nighttime temperatures are going to drop into the 40’s or below, I pull out a Big Agnes Dual Core insulated mattress pad. It’s inflatable, but also has a layer of closed cell foam for warmth. I’m a cold sleeper, and this pad has done it’s job wonderfully. Despite being a tad heavy and packing large, its warm, its comfortable, and its easy to use. Anything warmer, and I use the Sand Mountain insulated pad, which is a special model produced for REI that’s very similar to the regular BA model. It packs a lot smaller and is just as comfortable. Blowing up these 2.5″ inch thick inflatables can be a head numbing experience, but that’s the price for comfort. NOTE: I think it’s a fairly common issue, but my slick surfaced Montbell bags slide around on my slick surfaced BA pads. This can be an inconvenience if I don’t have perfectly flat ground to set up on. So recently I took the Sand Mountain and applied stripes of diluted silicone adhesive that creates a tacky feel. I’ve used the pad several nights since then, and I am satisified with the results. Depending on the forecast, I might also take along an REI fleece liner. It adds a couple of degrees to the temperature rating of the bag, it has plenty of room, and it helps keep the bag clean. On two ocassions, I’ve used just the liner without a bag. That usually goes in its own stuff sack. 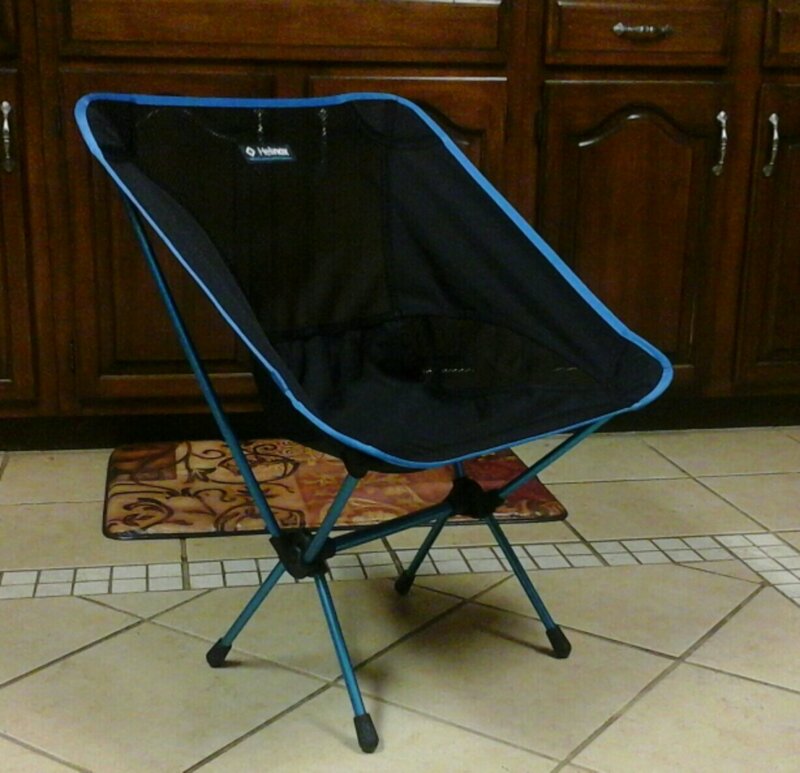 This might seem a little over the top, but I carry a camp chair. Both Helinox and REI make small chairs with DAC aluminum poles that weight just over two pounds. If wilderness camping and your choices are a rock, a rotted log, or one of these chairs; two pounds is pretty light. It gets folded up in its case and lays in the front basket. After experimenting with both compact and inflatable pillows, I ended up with a self-inflating import. It’s not the lightest or the most compact, but it is the most comfortable that I have run across, so I’m willing to sacrifice the space and weight. It also ended up being the most inexpensive option as well. I stick an MSR pack towel and a small hand towel in the top pocket, and the tent poles and stakes slide into the rear pocket. If it looks like the evenings and/or mornings are going to be cold, I have a Patagonia Down Sweater that stuffs down quite small. It’s an ultralight, rain resistant, 800 down full zip “jacket” made to either wear around camp or as a layer under a shell. It can also be pressed into service at night if the temperature really drops below the rating of the bag. The kitchen goes in the left pannier. In the fall of 2014 I decided to pare down the space and weight by putting together a titanium cookset that could be nested together. The kit consists of mostly Toaks brand: a 900 ml covered pot, a 300 ml bowl with a silicone insulating strip, and a 450 ml cup. Since ti transmits heat so well, I insulated the handles with gas line tubing, and picked up a set of Snow Peak Hotlips for the cup. The utensils are folding stainless. The Kitchen: 900 pot, 450 mug, 300 bowl. 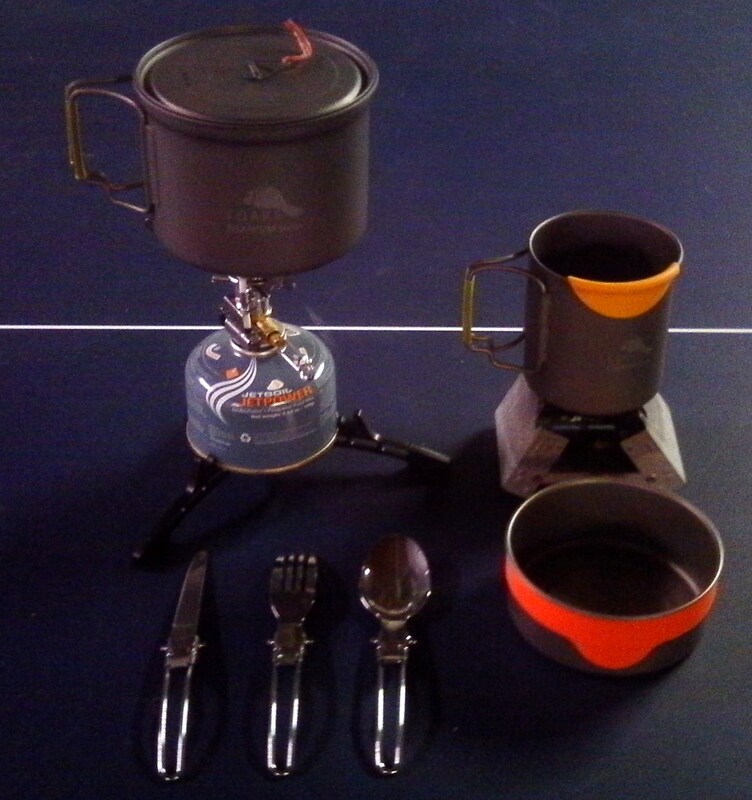 Stainless utensils, canister stove, Esbit stove. For stoves I have two options. A really compact and easy to use system is the Esbit. One tablet can heat enough water for a dehydrated meal, cup of coffee, or a bowl of oatmeal. 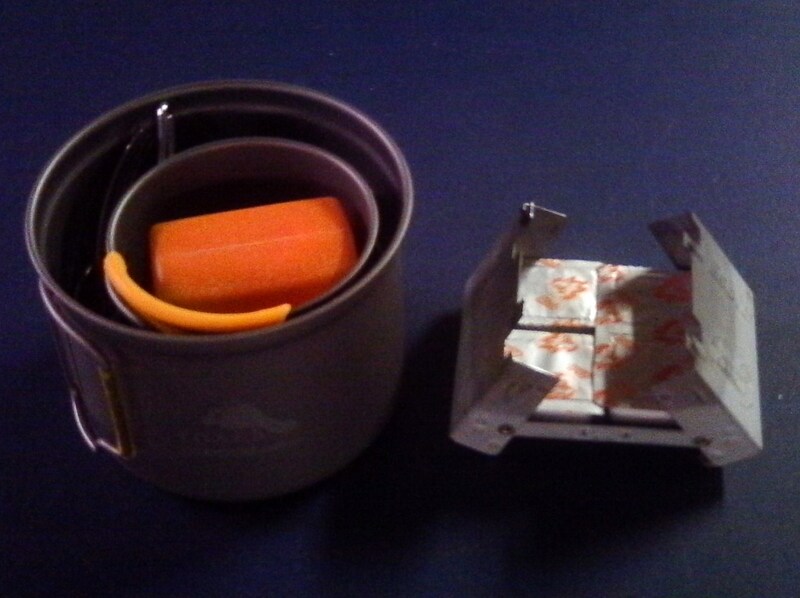 Option 2 is a small iso-butane burner that screws on top of the canister and allows for actual cooking. Of all the fancy models, this is a cheap import that I liked because of the dipersed flame, its ability to simmer, and how compact it folds up and fits inside the cup. Everything nests together neatly, not taking up much space at all; and leaving plenty of room for food and other items in the pannier. For coffee I had been using a Primus LiTech pot with a french press. 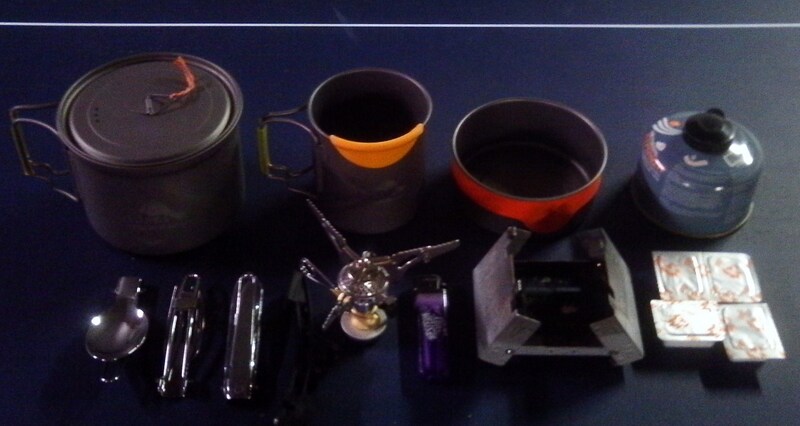 It does a decent job for a good cuppa brew, but honestly, for camping the cleanup is a pain. I’ll probably sell or trade it away now. I’m planning on using a simple pour-over filter system with the titanium kit, or there’s always Via packs which I’m not too crazy about the taste but they certainly save space and weight. I am curious about the Aeropress…. I use the bottom half of a milk jug for cleaning, eating, scooping water, etc… The rest of the main area is reserved for food, and a small baggy of salt, pepper, creamer, and sweetener. That still leaves a lot of room for any extra clothes I might need. The top pocket has a bag of baggies, some folded up foil, some more paper towels, hand sanitizer, dish soap, and a sponge. 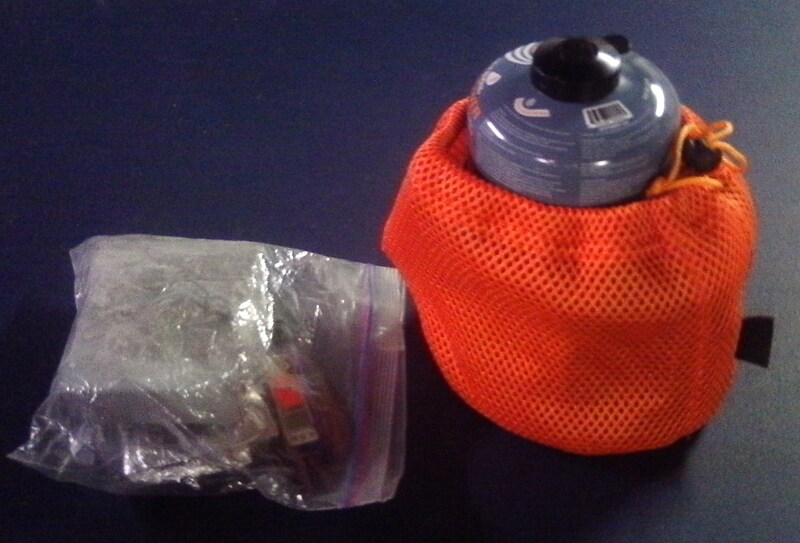 The side pocket holds a baggy of toiletries. If I’m really going off the grid, the rear pocket has a foldable cat hole trowel and a Steripen ultraviolet filter lamp for water purification. Let’s talk about that briefly. I know that some people advocate using the lightweight filtration units only, and maybe some iodine tablets, with the claim that they adequately remove bacteria. However, I live near a lake that periodically has e-colli issues, and I figure I don’t want to take any chances if I’m out in the woods and need to rely on “wild” water. Further, I hear of a lot of campers getting the trots due to unsanitary conditions. 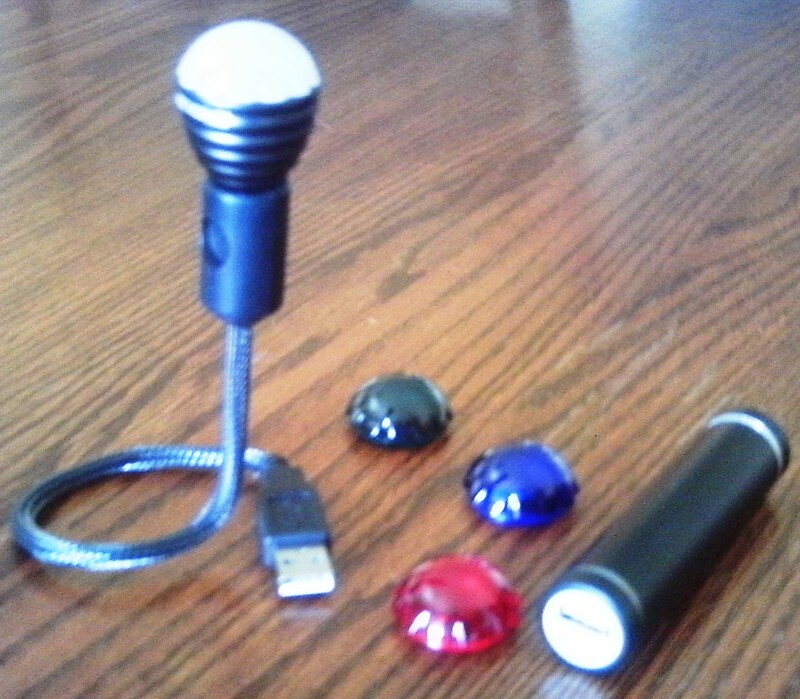 I was also turned on to the Steripen after reading about it in Kent Peterson’s blog. For camping, I normally carry two water b0ttles in cages: one 16 oz. bike b0ttle and one 32 oz. Nalgene bottle with a Steripen filter cap. The cap gets assembled so that you can pour in water, like from the milk jug, and larger particles get filtered out. If it gets clogged, you can unscrew the cap and shake it out. 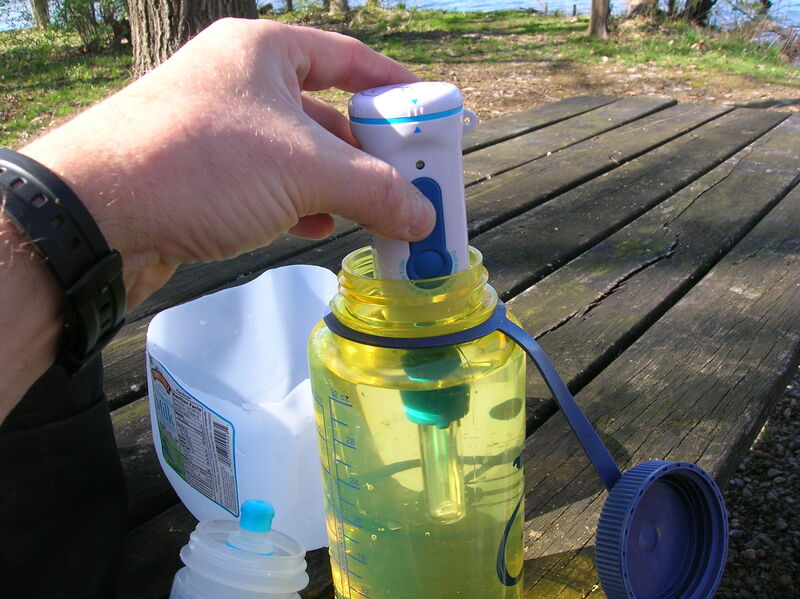 Once the water is strained into the Nalgene bottle, the lamp is inserted and used to kill any bacteria. It works off of four Nimh batteries, and is pretty quick. Topeak makes a cool bottle cage that can be adjusted for different diameters, so I can go from “normal” to Nalgene with the twist of a screw. The Trucker also has a third bottle cage, and that is where I’ll either add another water bottle, or carry a flask of cheap wine to enjoy with dinner. Finally, I have a small camera bag strapped above the headset. I’m not much of a photographer, but having it handy for my cheap old Nikon works well. 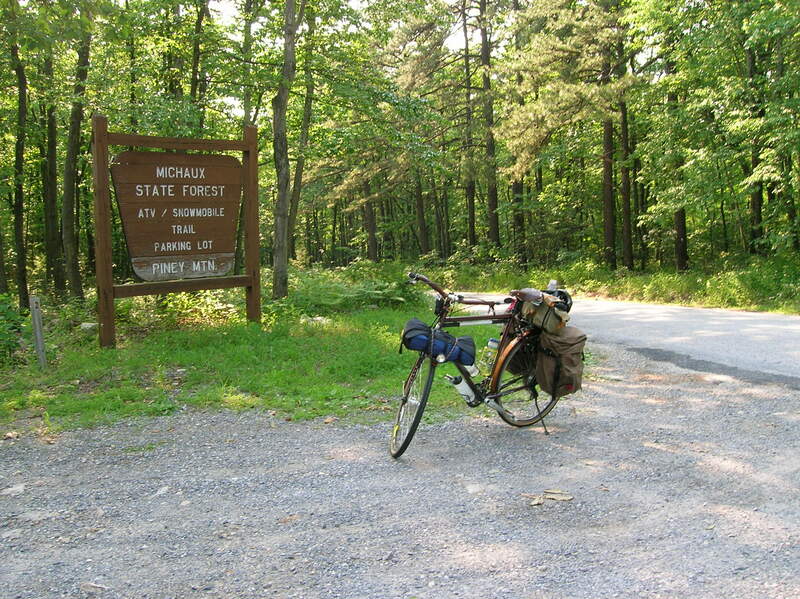 Now if…I manage to get out for a multi-day tour, I can bolt on the low-riders and I have a set of REI panniers that fit on the fork, giving me an additional 34 liters of storage for clothes and food. 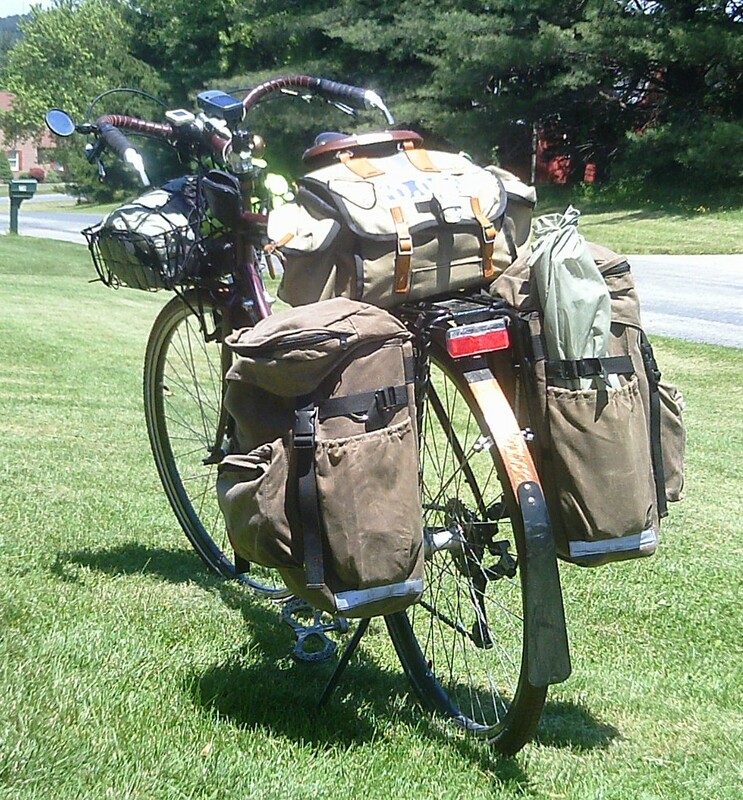 There is also room on the rear rack behind the Pendle for an additional compression sack filled with clothes, so I could probably go “off the grid” for some time. On an added note, I’ve recently started using high capacity USB batteries to top off various electronics, so I picked up a Firefly lamp. I’ve yet to use it, but I like the thought of having a “camp light” for the evening discussions and food prep.